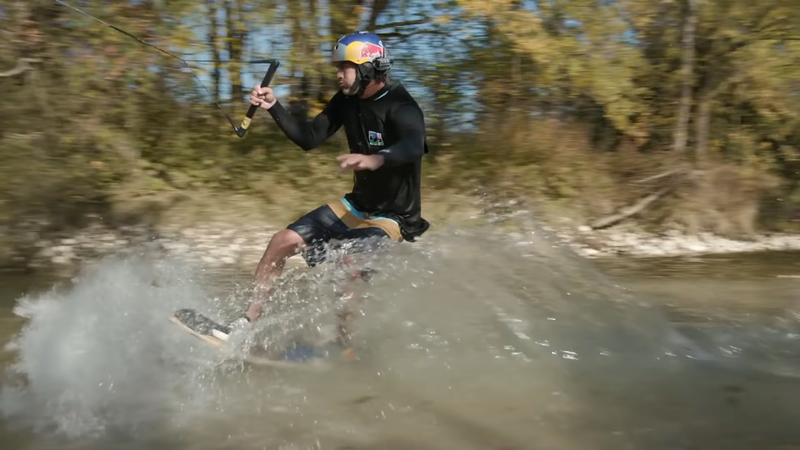 The wakeskate champion, Brian Grubb, used to drone equipped with a battery as powerful as smartphones put together, to ride down the Sava Bohinjka River, in Slovenia. Brian Grubb is unstoppable, followed by the RedBull cameras. For 15 years Grubb has been one of the leaders of this sport. Along with his board he has been to some incredible places on the planet passing through vulcanic deserts and the cape code icebergs. 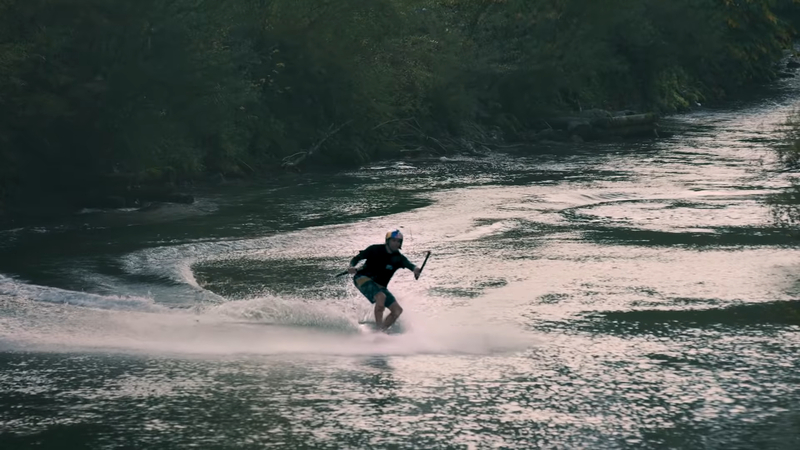 Although the Hidan Valley was going to be one of the biggest challenges of his career .. After the snow streams in Sarajevo, the Filipino rice fields and the Wadi Al-Hidan Canyon, it is pulled by a drone in Slovenia that we find the pioneer of the wakeskate! When it comes to the evolution of his sport, Brian Grubb is a true pioneer. In recent years the skillset of a Champion and the passion of an Explorer have taken the American to a number of truly unique locations all over the World. Brian Grubb is always looking to innovate in wakeskating and is famous for stunning projects like wakeskating at the historical Cleopatra Pool in Turkey. Now the American took the sport to new territory with his drone tow ride down the Sava Bohinjka River, in Slovenia. 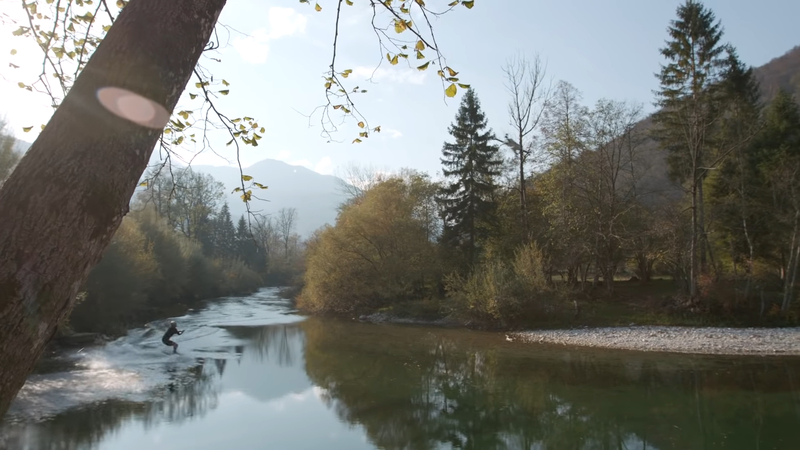 Teamed up with Infineon Technologies this time around, the New Hampshire native finally realized a dream he has had for years about taking wakeskating into the future with technology, to get an electric-powered quadcopter drone built that would be able to tow him down the idyllic crystal clear Alpine river, which flows deep in the mountains of Slovenia. The German company delivered a safe and reliable flying machine with a battery as powerful as 158 smartphones put together (1,5 kWh / 51,8 V / 30 Ah) and rotor blades stretching 80 centimeters in diameter. While majority of his past endeavours pushed the sport of Wakeskating mostly in terms of never before ridden waters and tricks, it was during his latest project when Brian has broken new grounds by acquiring help of a Drone. The impressive 24-kilogram machine could tow Grubb for 10 minutes straight and could even lift him in the air if needed with the 38-year-old completing a world first winch-to-drone handle pass as part of the project. “Skimming across the surface of a beautiful river, handle-passing from winch to drone on the go, tricking nice little wooden features and flying the drone under a bridge feels pretty damn good,” expressed Brian Grubb. If this isn’t some new upcoming duo team sport then i don’t know what is.